Isaac Damage You be the adjuster. Had a gate get loose during Isaac and damaged a panel. You get to play adjuster and give what you think a panel repair by the Mothership will cost. I have already filed a claim but haven't spoke to an adjuster yet, just trying to get ahead of what I expect to be a low ball. See what they could give you in writing. Thanks Bob. I will give them a call as you suggest. Cheaper than I was thinking, I had 4 to 5k in mind. Hope you are right. I have insurance but after reading the policy I am not sure what it covers. The cost to replace that one segment, including labor, is between $ 1200.00 and $ 1300.00, depending on the labor rate. The labor, as per the old crash book, is 6 hours. You had to remind me about filiform. Sorry, Jim...cruel, I know, but I just couldn't help myself! 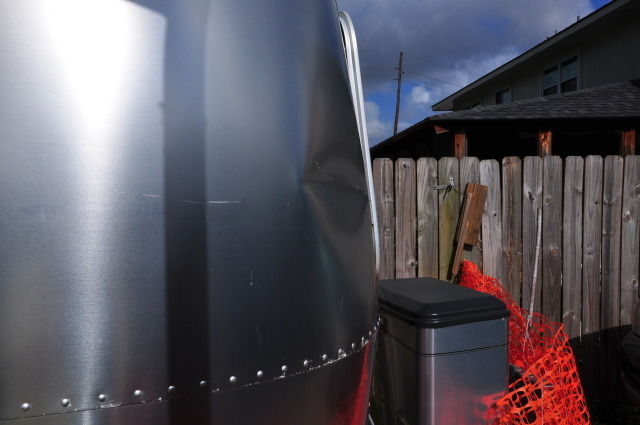 I've gotten a couple general quotes from airstream dealers. They both said typically its around 3k for labor,panel,rivets and waterproofing materials. I would suggest you find another dealer, or go to the factory.. 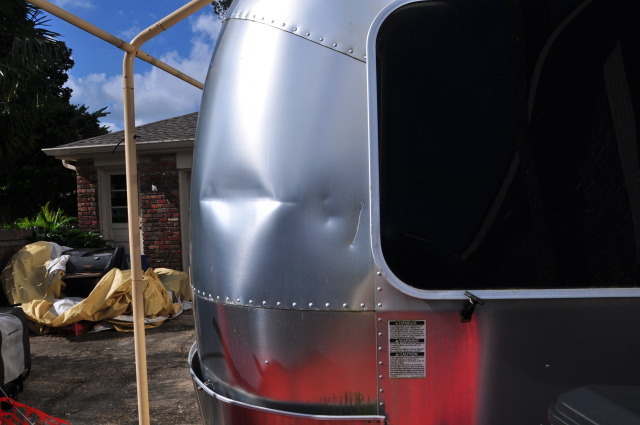 I feel that I pretty well know the repair costs, especially the labor, since I wrote the "'crash book" for the insurance division of Airstream, in 1970, and am also a dealer. There are, unfortunately a few dealers who like to sky rocket repair costs. That puts more unearned money in their pocket and quite well will have your insurance premiums sky rocket as well. 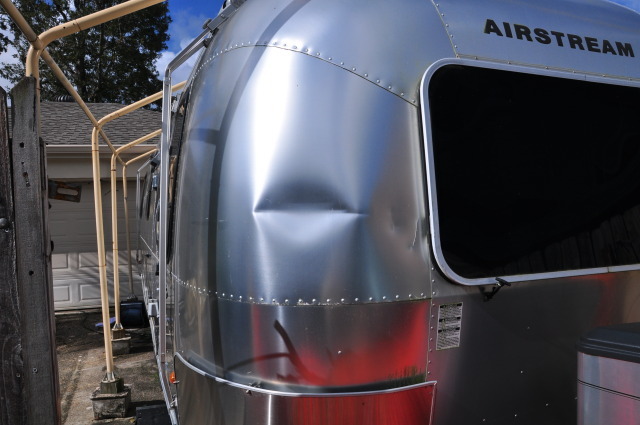 Airstreams retail price for that segment is $ 368.42. 120 Olympic rivets at 60 cents is $ 72.00. One tube of Vulkem sealer, ball park is $ 10.00. Total parts then, at retail, is $ 450.42. 6 hours labor at $ 100.00 per hour, as an example, is $ 600.00. That includes one hour to R & R the front rockguard. That totals to $ 1050.42, plus sales tax, of course. There is no painting required. Anything over that is simple robbery, or they are telling you, very silently, that they don't know how to replace a segment. Keep things fair and square. Ask them to describe in detail, how a segment is removed. If they don't mention anything about the "blind" rivets, then they don't know how to replace a simple segment. Most adjusters don't even know about the blind rivets. Well, if I estimate it like I did my frame repair, I'd say around thirty two dollars... give or take a few. Andy, I knew you would have a good answer, now you need to open another location or I need to make a trip to the west coast. Andy,I knew you would have a good answer, now you need to open another location or I need to make a trip to the west coast. How 'bout we split the difference between us, and Andy opens up a shop in Lower Alabama? If he'll open it this month, I promise to buy a set of axles. Would that work for you'all? Would work for New Orleans... not so much for the Florida crowd. Wait, I've got a brother-in-law in Houston we're going to visit this Christmas. Think a set of '74 axles would make it to Houston?